Every year the same thing happens. Cherry season hits, I indulge and buy a few pounds of those cherries with great intentions of making something great, something to share, but then I always end up eating them all myself. What can I say, I love me some cherries. I was going to make a straight up cherry pie, put then that would take me making pie dough, which I really like to do in most cases, but was just not feeling it this week. Plus that would have require a hell of a lot more cherry pitting which again, wouldn't have been that bad, but I was just hot really feeling it. But upside down cake, that I was feeling. I always like the visual aspect of an upside- down cake so cake it was, cake it be. Upside side down cake with a little lemony lemoness and lots of gooey cherry goodness. Simple and stunning and better then cherry pie because it is baked upside-down and you can't bake a pie upside-down. The stuff. Flour, baking soda, baking powder and salt in the bowl. A bowl of fresh cherries. White sugar, canola oil, soy milk, a lemon, a little apple cider vinegar, some vanilla extract, melted earth balance, and a bit of brown sugar. This is the most labor intensive part, pitting cherries. What I do is cut the cherries in half and then with my thumb, dislodge the pit. Pile the un-pitted halves to the side and once done pitting, double check you got all the pits out. No one will like you, including yourself, if they bit down and crack a tooth on a cherry pit. Time for cake batter. Mix the sugar and zest of the lemon into the bowl of flour, baking soda and powder, and salt. Stop when it is all mixed and incorporated. Don't want to over mix or the cake with get tough. Batter gets poured right onto cherries in pan and the whole sha-bang gets popped into the oven for about 50 minutes to turn into golden brown, upside-down cherry greatness. Now for the best part, you must wait at least a few minutes, if not ten, to pop the cake right side up? Or os it now upside down? And be careful cause it's hot. Tip . Before inverting cake, run a knife around the edge of the pan to make sure cake is loose. Once cake is upside down on cooling rack (use a cooling rack, not a plate so the bottom dset getting soggy), give the pan a good tap tap with a wooden spoon until the cake pops out. If a cherry or two got stuck, its ok, just stick it back to the cake.. no one will know. And loooooook at that. Upside down cakes are always like magic. As you can see, it didn't stand a chance. A piece cut within minutes because how can you not. I finally did it, I shared my cherry stash, and I feel good about it because all the people looooved the cake so it was worth it. And I still have cherries left for me!! Now go upside-down a cake. makes a 10 inch upside-down cake. Start by rinsing and pitting cherries. Remove all stems, cut cherries in half, and remove pits. I use my thumb and just kind of pop them out, but do it anyway you feel like. If using a fancy de-pitter, you are going to want to cut the cherries in half. After you have removed all pits, DOUBLE CHECK that there are no pits.. Pits will crack a tooth for reals. Grease and line a 10 inch cake pan with parchment. Dump the melted earth balance and brown sugar in bottom and mix together. Spread mixture all around then grab sliced cherries and place them, single layered, into mixture. Get as many as you can in there without overlapping. 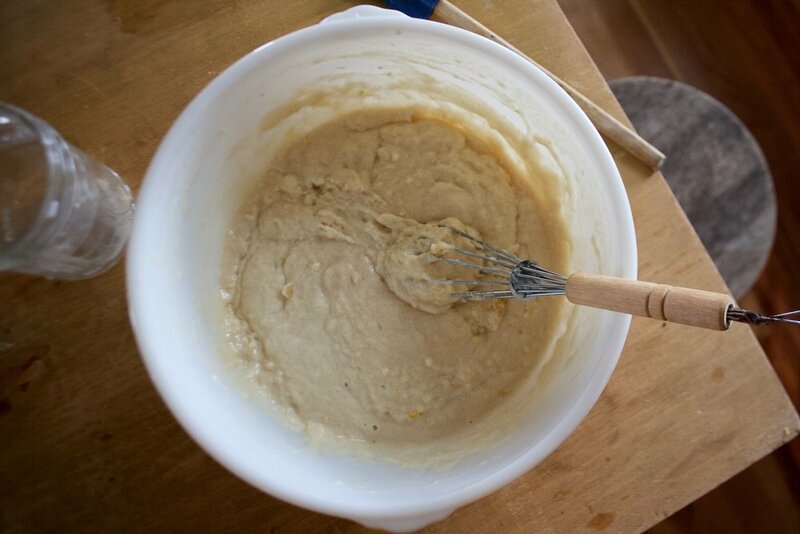 In a large bowl mix together the flour, baking powder and soda, the salt, the white sugar, and the zest of the lemon. Once fully combined add in the soy milk, apple cider vinegar, the oil, and the vanilla. Mix that all up until just combined. 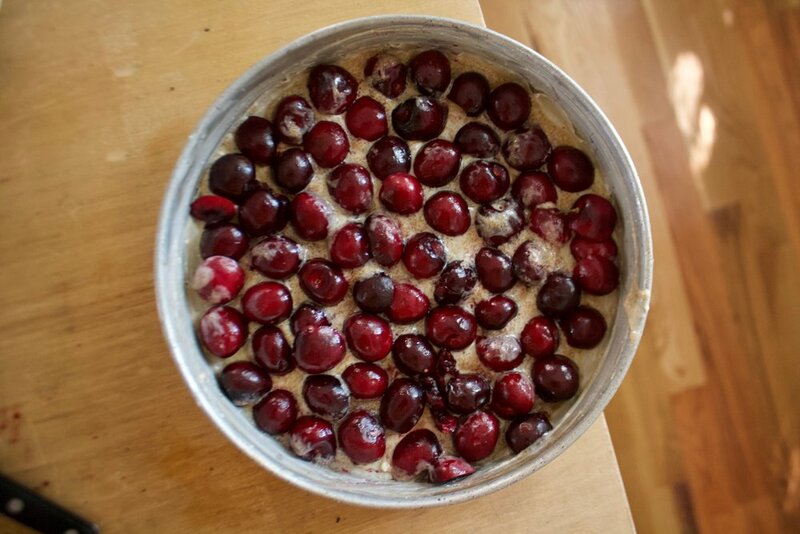 Pour batter all over the cherries in the pan. Level out batter and pop into the oven (middle rack) for 45-55 minutes, or until the cake is a nice deep golden brown and a tester stuck in the middle comes out clean. Once the cake is bake, let it sit on counter for about 10 minutes. Once slightly cooled, grab knife and run it along the edge of the cake. Take a cooling rack and place on top of cake then flip upside down. Tap around he pan with a spoon then gently lift pan away. Tada. You should have yourself something fantastic and great. And no worries if a cherry or two got stuck to pan, just pop it back on to the cake. And now all you need to do is eat the cake. So do that.